For many people, garage storage gets out of control over time. Putting items in the garage that you don’t want in the house can turn into a mess if it isn’t well organized. To solve this problem, focus on downsizing your possessions and improving garage storage. Before you go out and buy shelves and drawers to store everything you have in your garage, take some time to sort through what you have and decide what to keep or get rid of. Clutter accumulates over time so you might not even know what items you have in your garage. If you don’t remember you have it, you probably don’t need it. Start by sorting things into groups. There will be things that you use often and definitely need to keep. Then there will be a pile for things that you no longer need. This can be anything from broken tools to duplicate items. You can also have a maybe pile that you may need to revisit. Consider if you used the item in the last year. If you didn’t, it is just taking up space. If you have larger items or tools that need to be set flat, consider installing shelves or cabinets. Cabinets are great for storing cans of paint or other chemicals that you don’t want to leave out in the open. Shelves and cabinets offer valuable space for garages with less square footage since they create vertical storage. Clear plastic bins are excellent for improving garage storage because you can keep like items together and see what is inside immediately. They come in all sizes and can be stacked on shelves to keep the floor clear. Installing a pegboard on one of the walls of the garage helps keep your tools organized and accessible. 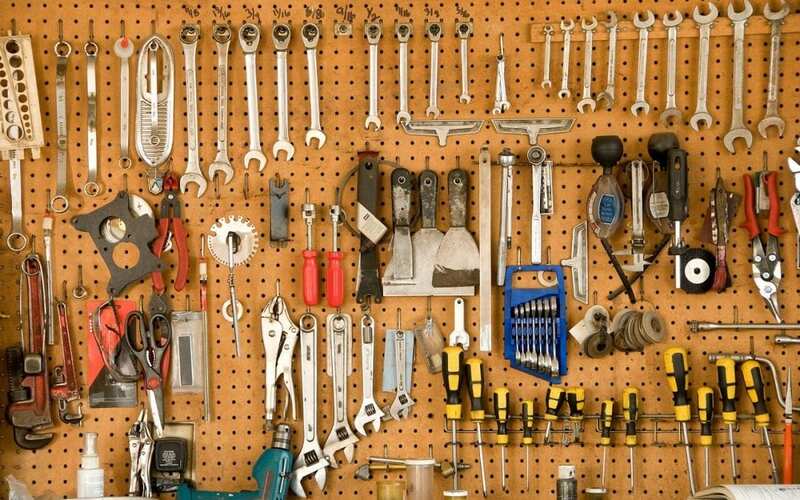 When your tools are all hanging, they are visible so you can easily grab what you need instead of rummaging through a toolbox to find it. If you are pressed for space, consider a platform that hangs from the ceiling where you can store your larger and seasonal items. Improving garage storage this way is excellent because it keeps things out of the way. Seasonal items (sleds, pool toys, decorations) can be swapped out depending on the season. To make it more accessible, install a pulley system to lower the platform. The key to keeping your garage neat is to have a place for everything. When you know where everything belongs and you put it back after each use, you will always be able to find what you are looking for. Improving garage storage can be daunting at first, but using these three steps makes it manageable. You’ll be able to see your progress as you go from downsizing to organizing and then maintaining what you have created. Professional Inspection Network provides home inspection services to Southern California. Contact us to book an appointment.